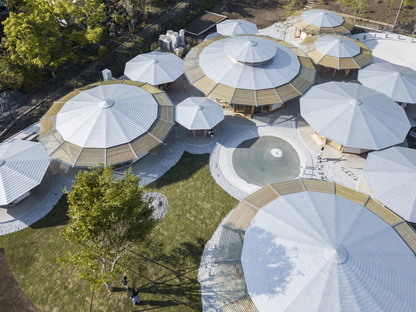 The Muku Nursery School in Fuji City was designed by the Japanese firm, Tezuka Architects and is composed of circular, umbrella-like structures for the classes. The Muku Nursery School in Fuji City was designed by the Japanese firm, Tezuka Architects and is composed of circular, umbrella-like structures for the classes. The complex of wooden volumes with this unusual shape won the School - Completed Buildings category of the 2018 World Architecture Awards (WAF). When the topic of architecture for early childhood comes up, we find a series of very interesting projects that adopt an unusual architectural shape to try and make the young users feel at home and to foster their development. A number of virtuous examples have passed through Livegreenblog, from lots of different places including Mosco), Nuremberg and Thailand, just to mention some of the projects we have published. 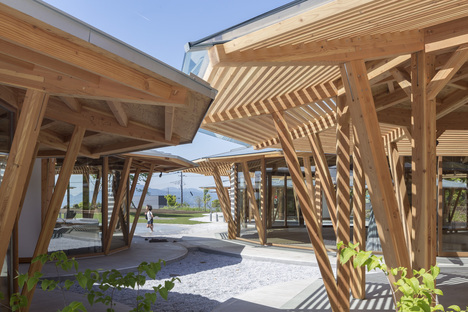 The Muku Nursery School by Tezuka Architects, the husband-and-wife firm founded in Tokyo in 1994, is another addition to this collection of excellent architecture for early childhood, confirmed by the award won at the 2018 World Architecture Festival (WAF) in the School - Completed Buildings category. 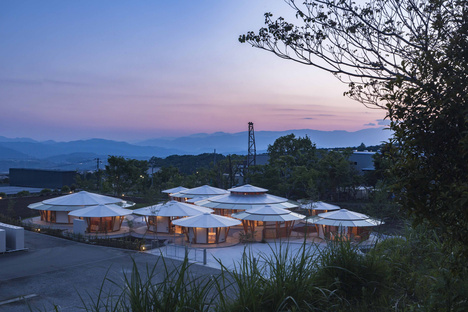 The project itself starts from a circular layout, expressing this geometric shape not in the form of a ring - which the same firm had already used in their design of the acclaimed Fuji nursery school in 2007, developed around a centuries-old tree - but in the form of “bubbles”. These are ten separate buildings made from wood, glass and translucent walls that, when viewed from above, look a bit like different sized soap bubbles slowly rising up in the air. Each bubble - or umbrella-like structure - is used for one specific function and there are no walls inside. Like the mitochondria and ribosomes they are reminiscent of, these circular volumes provide a total area of 403.51 square metres, and their interior structures feature low furniture and partitions that are suitable for children. The goal of Tezuka Architects was to position each function and keep it completely free of any geometric constraints. This absence of restrictions coupled with the round shape stimulates movement for the children who can let off steam running around in and between the various circles. Not only that but the circular layout of the buildings and of the space itself also assures excellent visibility, something very important in a nursery to make sure you can keep an eye on the children at all times. The single bubbles are positioned quite close to each other, to foster a real and a visual connection between the classrooms. At the same time, it allows great views of Mount Fuji, a stunning backdrop that becomes part of the children's everyday experience. The Muku Nursery School by Tezuka Architects underscores the modus operandi of these architects. When they design a building, their main concerns is to create spaces that are open and welcoming to nature, which they always appreciate and treat with great respect. At the same time, they view people - the users of architecture - as a part of all the aspects of the existence of the architectural work. So their designs are always open to the myriad of possibilities served up by the context, rather than being closed, self-serving containers.